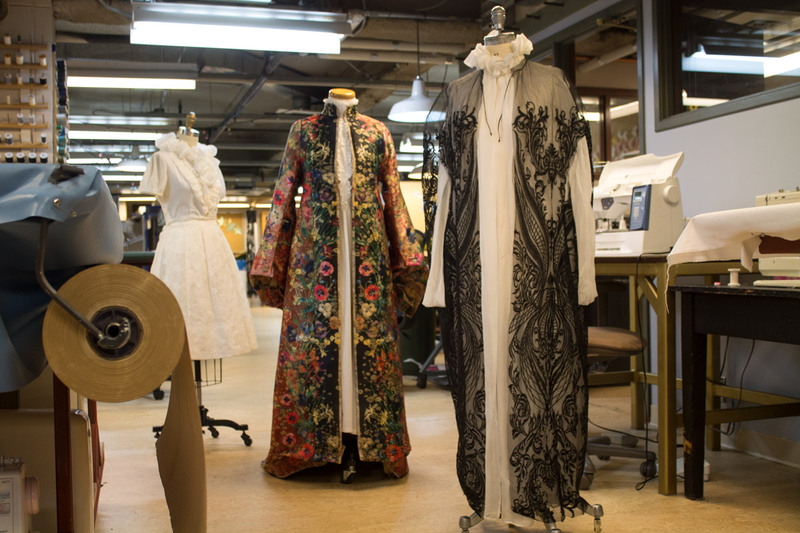 Inside ATP’s costume shop, costume designer Heather Moore shares the inspiration behind the play’s costumes and what goes into bringing characters to life through their clothing. (Left to right) Bess's white "Alice in Wonderland" look, Bess's hand-made dressing gown and Mary's nightgown at ATP's costume shop. Photograph by Alyssa Quirico. The Virgin Trial (on now until September 29) is the sequel to Canadian actress-turned-playwright Kate Hennig’s debut 2017 play The Last Wife, which focused on Katherine Parr, the sixth wife of King Henry VIII. Hennig is currently writing the third play in the series. The current production of The Virgin Trial is a political thriller that takes place after Katherine’s death in the 1500s. It focuses on 15-year-old Elizabeth I who must defend herself in trial against accusations that she plotted to kill her brother, nine-year-old King Edward VI, and had an affair with her stepfather, Thom Seymour (played by Haysam Kadri). All the while, her older sister Mary (played by Helen Knight) is next in line to be queen. 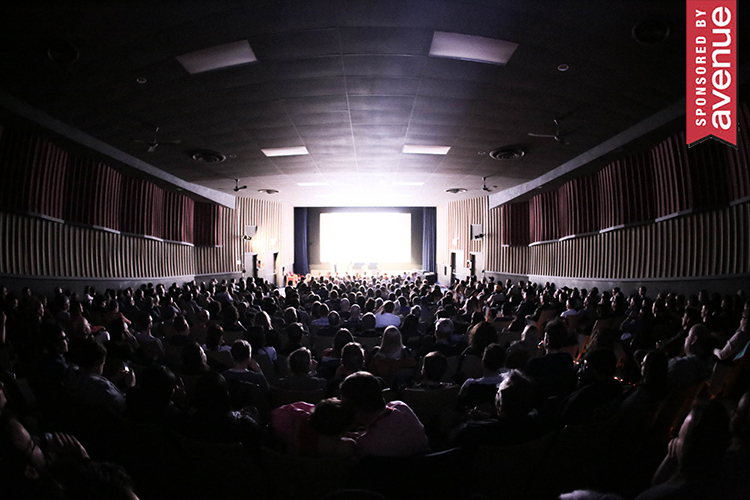 The Virgin Trial features the same actors, director, set designer and costume designer as the first play. “It’s interesting because it’s a Canadian, female playwright’s voice and these are women around Henry VIII who really influenced history,” says Moore. In the costume shop, Moore stands at almost the same height as the mannequin, fluffing up the white silk neck ruffle Mitchell has just made. The two of them go back and forth about how high it should sit. Behind them, dusty-looking, wrinkled men’s Henley shirts hang on a rack after being “aged” for scenes when some of the characters have been thrown in prison. The shop, accessible only by walking three floors up in Arts Commons, takes up almost the entire floor. Beneath the low-hanging ceiling are sewing machines, ironing boards, tables covered in pieces of colourful fabric and hundreds of spools of thread on the walls. Head of wardrobe Mitchell is ATP’s only full-time wardrobe employee, so a costume designer is contracted for each show. Moore, who also worked on The Last Wife, has been working in costume design in theatre, television and film (including AMC’s Hell On Wheels) for nearly three decades. She and her playwright husband founded Ghost River Theatre and she is also the head of wardrobe at Calgary Opera. 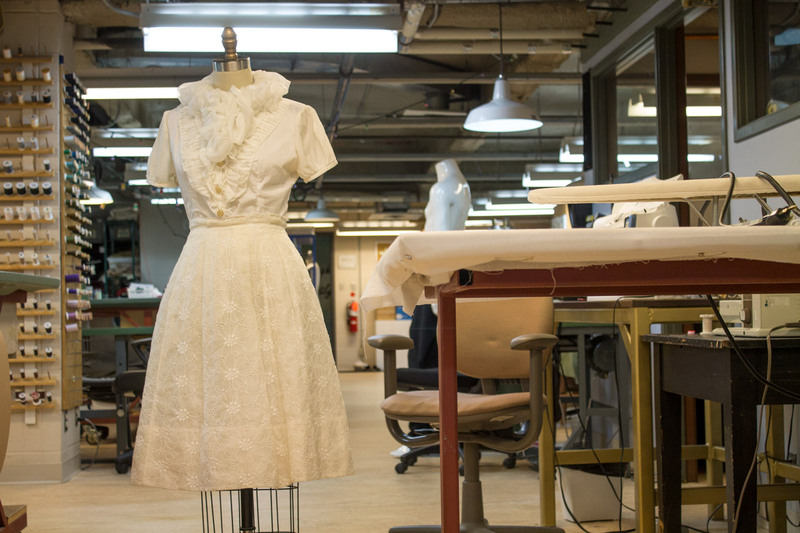 The process of costume design is a lengthy one. Moore began talks about The Virgin Trial with director Glynis Leyshon in January and says she read the script four times through before she began conceptualizing. She began purchasing and making clothes in June. The team works until almost the last minute, Moore explains. In the week leading up to the premiere, they’re watching dress rehearsals to track how the actors move on stage in the costumes and where they enter and exit. Another factor in costume design is what are called “quick changes,” when the actor must change their costume off-stage in as little as 15 seconds sometimes. To accommodate this, adjustments are sometimes made such as adding magnets or Velcro in place of buttons or clasps. This is what Moore refers to as Bess’s “Alice in Wonderland look.” Both the blouse and skirt were purchased at Curated Consignment on 14th Street S.W. and appeared in The Last Wife. The skirt is a limited-edition Dolce & Gabbana and the blouse is Chloe. The added neck ruffle was made in-house. Moore says she specifically chose the skirt because the eyelet pattern reminded her of a Tudor rose. She says that while the clothes are contemporary, the silhouette created here is reminiscent of the historic time period. 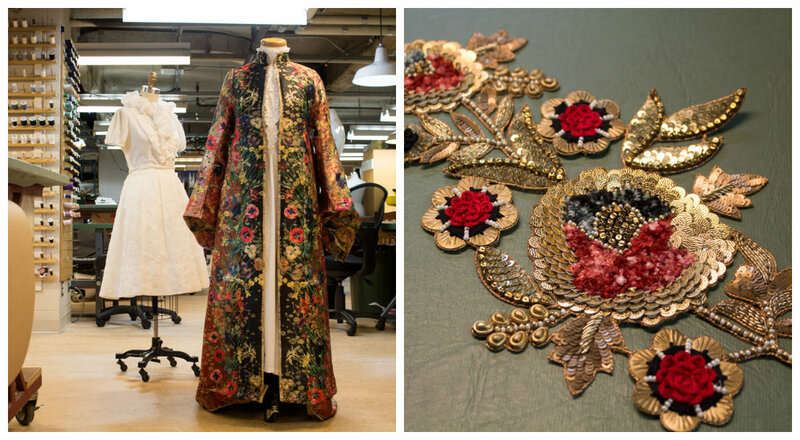 (Left photo, the outfit on the right) Bess’s royal robe was made in-house. In this photo, it’s still being constructed and the hems are being held in place with pins. The fabric for the robe was ordered from New York and the colours are meant to mimic a Hans Holbein painting that is used in the set design. “It adds a bit of beauty in this somewhat bleak telling of this 15-year-old girl’s life,” says Moore. She explains that in the play there are two “camps” being interrogated. One is Bess and her two associates and the other is King Edward VI’s associates. Bess’s associates wear neckties made of the same fabric as her robe to show the audience who is in which camp. (Right photo) This applique was ordered from Indonesia to be added near the shoulder of Bess’s royal robe. Underneath her robe, Bess wears an antique nightgown that was purchased in New York. The nightgown is thought to be from between 1890 and 1905. The ruffles (left) are all hand-crocheted and there is an insignia (middle) written in fountain pen ink along with an “F” embroidered behind one of the buttons (the button holes have been replaced here with Velcro). It appears that one of the buttons (right) fell off and was replaced with another. Aside from the odd stain, the nightgown is in pristine condition. The black-and-white silk chiffon nightgown (the outfit on the far right) was made in-house last year for the character of Katherine Parr in The Last Wife. Moore says she wanted to create the illusion of a cage with the rounded silhouette. In The Virgin Trial, Bess’s sister Mary is shown wearing her late stepmother’s gown upon hearing some upsetting news. The purpose, Moore says, is to show that Mary has her stepmother close to her at that time. Both Thom and Bess’s equestrian garments are authentically British. They were ordered from esteemed English brands Equetech, Darcy and Equus. “We have equestrian riders here in Calgary but I wanted that British feel to it,” says Moore. She explains that the style of Thom’s waistcoat (middle) is typical of that British style, which is less sporty and more traditional with the buttons sitting higher up. Bess’s Equus riding boots (right) are admittedly Moore’s favourite piece in the wardrobe. 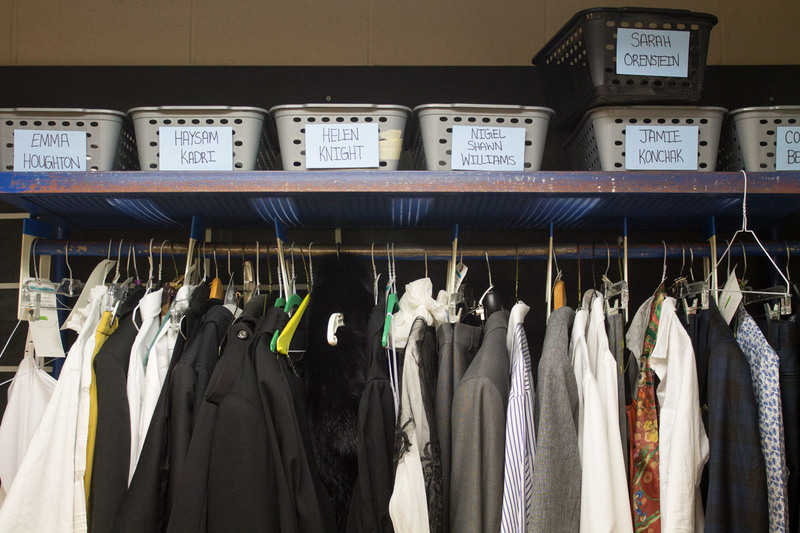 Baskets hold the cast’s on-stage accessories, which include sunglasses by local designer Kate Hewko, and their wardrobe hangs below. 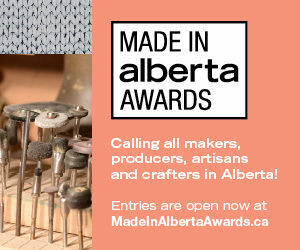 It’s a mix of pieces handmade in ATP’s costume shop, pieces from England and New York, custom-made suits by Indochino in Chinook Centre, and pieces sourced from Hudson’s Bay and local consignment shop Curated on 14 Street S.W..